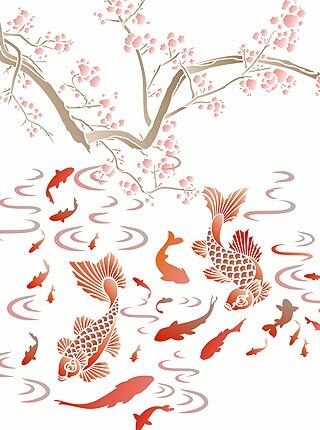 The Small Fish Silhouettes Stencil is a single stencil sheet design containing eleven different sized small koi carp fish silhouettes, with additional water swirl motifs. 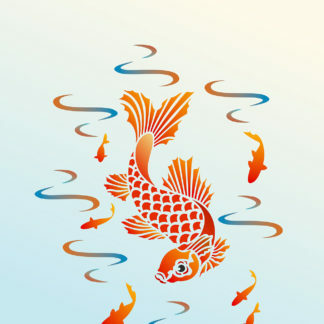 Use this stencil on its own or with our popular Little Koi Stencil 1 or Little Koi Stencil 2, or buy all three together as the Little Fish Stencils Theme Pack at a reduced combined price. 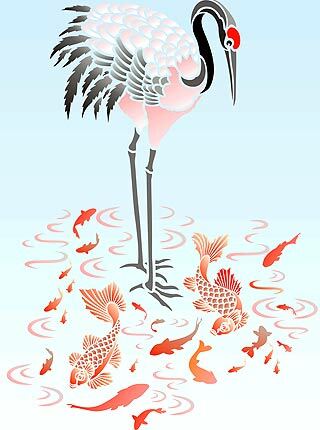 These stencils also work beautifully with our Large Standing Cranes Stencils, Blossom Stencils and Waterlily Stencil, or with the larger Koi Carp Stencils. 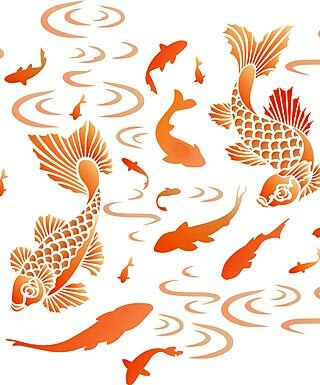 Use the different koi stencils on walls, furniture, curtains and accessories. See size and layout specifications below. 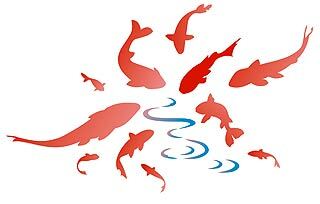 Above – all fish and water swirls motifs of the Small Fish Silhouettes Stencil arranged in a circular formation, stencilled in Very Berry, Seville Orange and Paradise Blue Stencil Paints. 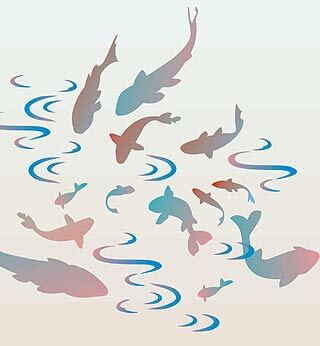 Above – the fish and water swirl motifs of the Small Fish Silhouettes Stencil are stencilled randomly together in a swimming group. Stencilled in soft Damask Rose, Sienna and Paradise Blue Blue Stencil Paints on a pale pink background. 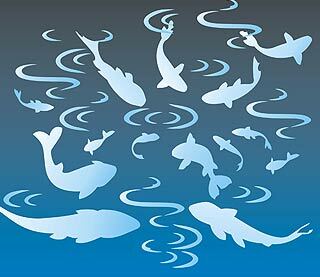 Above – the motifs of the Small Fish Silhouettes Stencil can be arranged in any way you choose – group the fish swimming together or around an object or just randomly – creating the way the fish appear in your pond!! 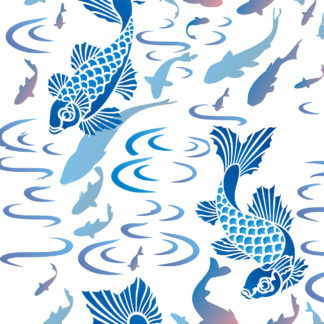 Here the fish are stencilled in Persian Blue, Atlantic Blue, Paradise Blue, Indian Purple and Cherry Blossom Stencil Paints on a pale aqua coloured background. 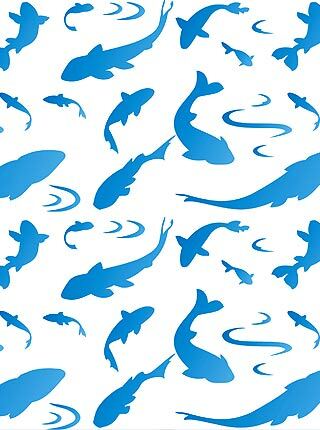 Above – the Small Fish Silhouettes Stencil sheet is repeated in rows to create a fishy wallpaper effect! 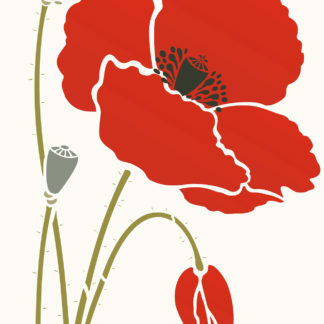 Stencilled in Very Berry Stencil Paint. 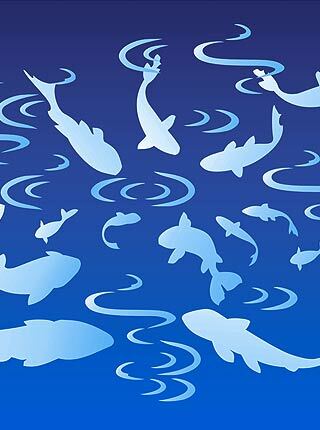 Above – the Small Fish Silhouettes Stencil is stencilled with both Little Koi Stencil 1 and Little Koi Stencil 2 in random swimming pattern. Stencilled in Seville Orange and Very Berry Stencil Paints. 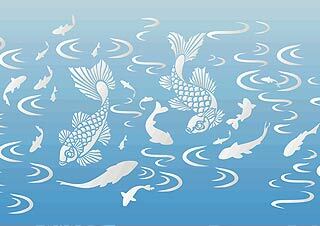 Buy all three fish stencils together as the Little Fish Stencil Theme Pack at a reduced combined price. 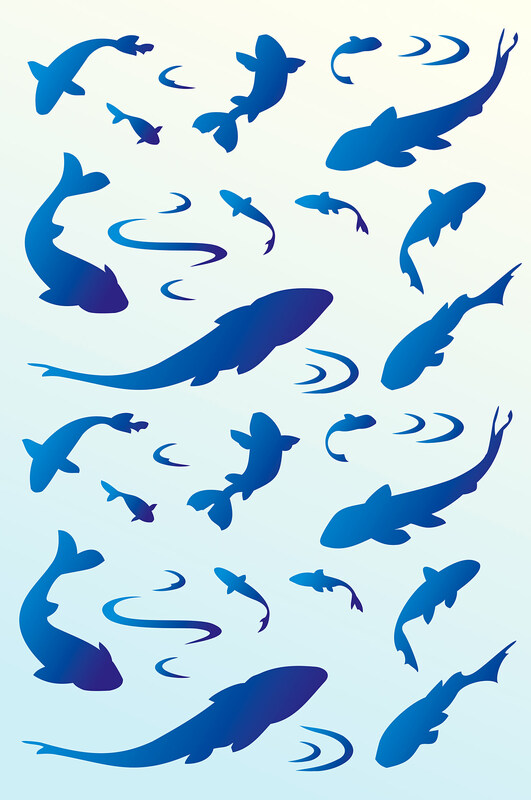 Above and below – the Small Fish Silhouettes Stencil shown in different layouts with Little Koi Stencil 1 and Little Koi Stencil 2. 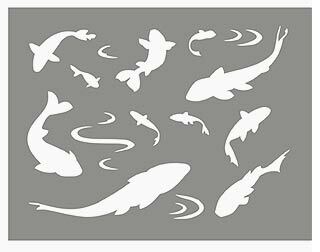 These three stencils can be bought individually or purchased as the Little Fish Stencils Theme Pack at a reduced combined price. Stencilled in Persian Blue, Atlantic Blue, Summer Skies, Arctic Grey Stencil Paints (above) and Ice White Stencil Paint (below). 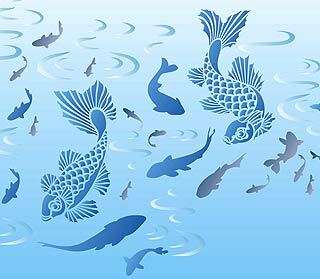 Above – the fish motifs of the Small Fish Silhouettes Stencil are grouped around the water swirl motifs, stencilled in Vanilla and Chinoiserie and Duck Egg Stencil Paint on a blue background. 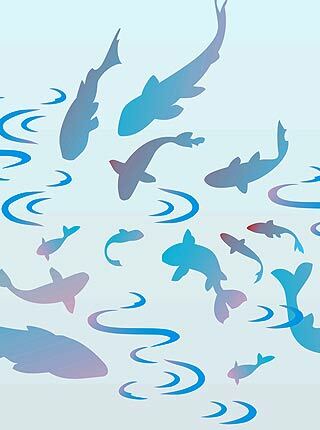 Above – the fish and water swirl motifs of the Small Fish Silhouettes Stencil are stencilled randomly together in a swimming group. 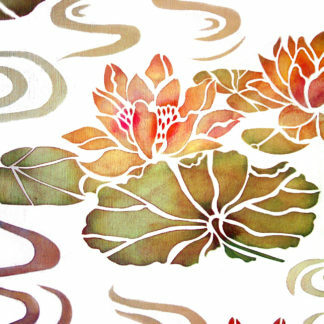 Stencilled in Chinoiserie and Vanilla Stencil Paint on a dark watery background. 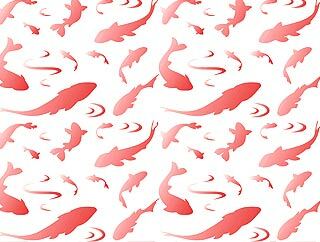 Above – the Small Fish Silhouettes Stencil sheet is repeated in rows to create a fishy wallpaper effect! 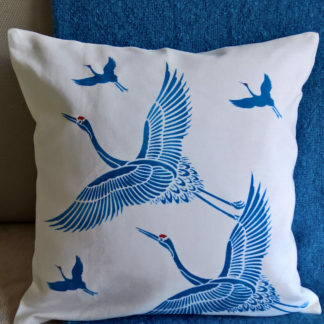 Stencilled in bright Persian Blue and Paradise Blue Stencil Paint. 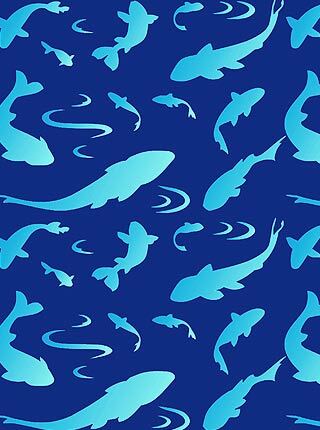 Above – the Small Fish Silhouettes Stencil sheet is repeated in rows on a contrasting colour background to create this striking finish in Paradise Blue blended with Vanilla Stencil Paint. 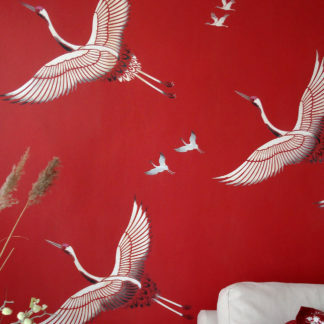 Above – the motifs of the Small Fish Silhouettes Stencil are arranged in a random grouping on a striking red background. Stencilled in Orchid and Damask Rose Stencil Paints. 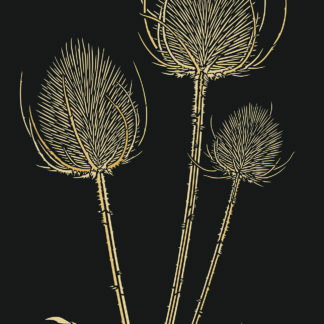 Above – the same arrangement of the Small Fish Silhouettes Stencil, stencilled under one of the branches of the Japanese Blossom Stencil. Above – here water swirls and fish motifs of the Small Fish Silhouettes Stencil and Little Koi Stencils 1 and 2 are stencilled around the feet of the Large Crane Stencil. 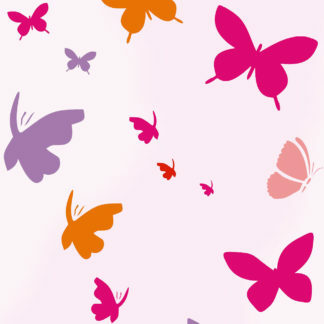 Stencil Paints used here – Very Berry, Seville Orange, Orchid, Arctic Grey and Jet Black Stencil Paints on a pale blue background. 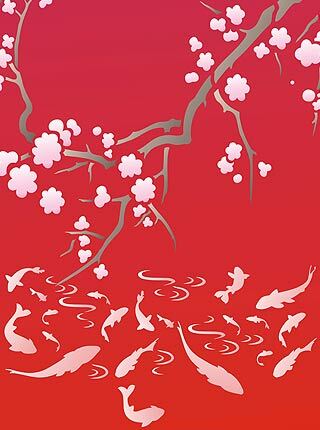 Above – the Small Fish Silhouette Stencil is stencilled with Little Koi Stencils 1 and 2, under the branches of the Cherry Blossom Bough and Moon Stencil. 1 layer stencil on 125 micron mylar. Largest tapering fish measures up to 15.2cm (6″) long. Medium fishes between 6cm (2.25″) and 9cm (3.5″) long. Smallest fish silhouette 3.5cm (1.25″) across. Sheet size up to 21.5cm (8.5″) deep x 28cm (11″) wide. Illustrated Left.